The T-216 Bunk Feeder for cattle feeder has a pipe running down the center to help keep the cattle out. 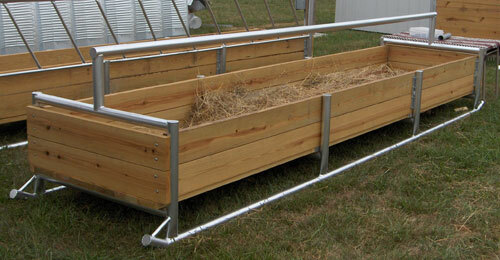 It is built from 2 1/2″ Heavy wall tubing welded into a solid unit with 2″ X 8″ # 1 grade treated lumber bolted on. This bunk feeder measures 25″ to the top of the side board with the retainer pipe set in 20″ allowing it to be loaded from a auger wagon.